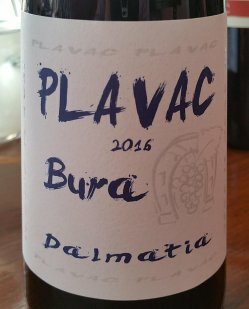 If you read my last post, you will know by now that Pošip and Plavac Mali are names of grapes used in South Dalmatia for varietal wines, white and red respectively. Also you will know that Pošip tends to be grown on the island of Korčula, while a lot of the Plavac Mali comes from the Pelješac Peninsula. Dingač on the other hand is a PDO name, for Plavac Mali wines from a particularly favourable site on Pelješac. Of the wines from around Dubrovnik, these are the ones that I tasted and drank enough of to get to know, and you will find them readily available if you visit. There was quite a variation in the Pošips I drank and tasted. None were exactly bad, but some were rather unexciting – neutral and fresh was the best you could say of them. Others were considerably more intense and aromatic, and they were the ones I enjoyed most. An example was the one shown here, which I drank at Buffet Peninsula on Pelješac. This Pošip was 2016, 13.5%, Central and South Dalmatia PDO, made by Toreta, and from Korčula. It was intense, and in my opinion pungent in the Sauvignon Blanc cat’s-pee way. But while this was most definitely dry, it also had some honeyed aromatics that tempered the pungency. And those honeyed notes moved it away from anything that could be considered to be Sauvignon Blanc. Were it available in the UK, I think it would retail for a very reasonable £15. Another favourite was a little cheaper, and from D’Vino Wine Bar in Dubrovnik. It was made by Antunović, 2016, 12.5%, and with the same PDO, but this one was from Pelješac. It was hugely intense, fresh and herbaceous, and had a good smooth mouthfeel. There were also sur lie Pošips, which were more rounded and complex. These seemed to be generally highly regarded and attracted a small price premium. I must admit they were good too, but on balance I preferred the more aromatic versions that were perhaps less nuanced. Looking through my tasting notes, the Plavac Mali wines I tried also had a lot of variation. The fruit varied from red to black berries, and there were varying degrees of oakiness. Levels of astringency also varied, but tended to be a bit on the high side compared with most other varietals. And the degree of complexity increased, perhaps predictably, with price and age. I will highlight below a couple of Plavac Mali wines I particularly liked. 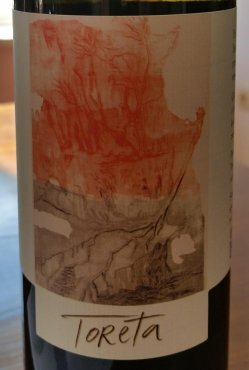 At the cheap and very cheerful end of the spectrum was the 2016, 13.5%, Plavac Mali made by Bura, illustrated here. It was the equivalent of £4.80 retail for a bottle at Buffet Peninsula, which I guess would be just under a tenner if it made it to the UK. The bottles I saw were labelled for the US market, and under screwcap. This wine was immediately appealing, with fresh acidity, low astringency, and bursting with juicy blackberry fruit and violets. Absolutely delicious in a straightforward sort of way, and absolutely a bargain. A lot more expensive, and considerably more serious, was the 2005, 14.3%, Stagnum, made by Frano Miloš. This was beautiful – intense, complex, smoky and spicy. It had acidity to match the Bura described above but, even after 12 years, a good whack of tannin. The only problem with this wine was that it was very ambitiously priced at around £80 direct from the winery, so maybe £120 UK retail. In the sense that I have had worse wines that have been a lot more expensive, the price is maybe not so stupid, but nevertheless such a high price did act as a deterrent to buying. I did though get a bottle of the 2006 vintage, at around £50 from the winery, which had similar structure and I would characterise as lifted, complex, and aromatically delicate. The 2007 Stagnum was being sold for only £25, so obviously the winery put a large premium on aging. Miloš also make a cheaper Plavac wine, which was also good enough for me to buy. 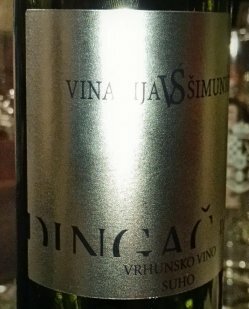 I found Dingač to be similar to non-Dingač Plavac Mali wines in their variation, but with the volume turned up – more intense, more alcoholic, more tannic. The wine illustrated here is a 2015 Dingać produced by Šimunković, a small producer I believe, which we drank at Lady Pi-Pi with barbecued meat. I absolutely enjoyed it, but the main reason I mention it here is because that it was perhaps the most memorable wine of the trip. If Dingač is Plavac Mali with the volume turned up, this one was playing at full blast, with a declared 16% of alcohol, good acidity, massive tannins, and dark fruit aromas that managed to be both fresh and raisiny at the same time. Not usually my favourite style of wine, but in this meat-filled context it worked exceptionally well. It was £44 on the restaurant wine list, and I would guess that would be the equivalent of £25-30 retail in the UK. My notes tell me that I enjoyed a couple of other Dingač wines even more, but the descriptive part of those notes is very poor, so I will just give them a quick mention. They were both tasted at the Peninsula Buffet wine bar. One was produced by Bura. It was 2015, 15,5%, and with an estimated UK retail price of £37. The other was a little cheaper at an estimated UK retail price of £25. The producer of this one was Ponos, and the vintage 2015. At 14.9% it was the lightest of the three Dingač wines mentioned here, and was also more moderate in tannin. Lots of donkeys on the label – a common motif for Dingač, as they were used to carry the harvest over the mountain to the winery. And here ends my series of posts on Dubrovnik and South Dalmatia. Do feel free to let me know if you have any questions or comments. This entry was posted in My tasting notes and tagged croatia, dalmatia. Bookmark the permalink. Went to a Milos tasting last year at the Uni here. The wines were really interesting, but definitely not easy, with forbidding tannins. They do age brilliantly, with even the early 90s wines tasting like it still has some way to go. Scarily expensive though! Of the red wines, I tried the Plavac 2013, and Stagnum 2007, 2006 and 2005. I would only count the youngest Stagnum as having high astringency/tannin. But the others were still higher that most red wines. Personally I didn’t find the tannins unpleasant, but I think that sort of thing is very much down to individual taste. Would be happy to drink the older Stagnums now, as they were already developing interesting tertiary notes, but would also be curious to see how they develop. I shall look out for any opportunities to try older wine! Did you try any of their sweet wines? I decided to pass as it was the start of quite a full day of tasting.